March 1: The Flames traveled to Phoenix for the first of two back-to-back games on the road. Calgary got up 3-0 but nearly blew the lead. Thankfully, they didn’t, and the Flames won 4-2. Jarome Iginla had two points and the top line played their best game in weeks. March 2: With rookie Leland Irving in net, the Flames lost their 15th consecutive regular season game in Anaheim, dropping a 3-2 decision to the Ducks. Trailing 2-1 heading into the third, the Flames clawed back with a goal by Alex Tanguay. But, alas, they gave up a Ryan Getzlaf slapper with just 46 seconds left to lose the game. Irving made 35 saves. March 4: Returning home, Calgary basically repeated their effort from Anaheim. They scored first, gave up two goals and entered the third period trailing 2-1. Then the top line picked up a goal to tie it. Instead of blowing the lead in the last minute, they lost in a shootout and got the loser point with a 3-2 final score. March 6: In a wild and wooly affair, the Flames got out to a 5-2 lead and then hung on for their lives, eventually surviving to beat the Montreal Canadiens 5-4. 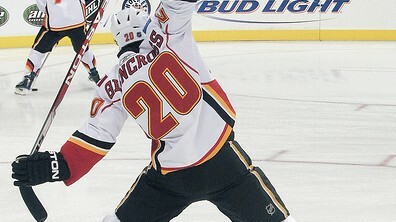 Jarome Iginla had 2 goals and Curtis Glencross had three points. Monday morning was surprisingly busy at the Scotiabank Saddledome. Fresh off a 3-2 shootout loss to the Dallas Stars on Sunday evening, the Calgary Flames discovered three new holes in their roster that needed filling. To cover for injuries to Blake Comeau, Mike Cammalleri and Lance Bouma, the Flames recalled Guillaume Desbiens, Krys Kolanos and Greg Nemisz from the Abbotsford Heat. All three have been up with the big club already this season and all three began Tuesday’s game against the Montreal Canadiens on a line with each other. Through the first 67 games this season, injuries and injury replacements have been no stranger to the Calgary Flames. At time of this writing, the Flames have lost 304 man-games due to injury or illness and used 38 different players in their line-up. While it’s not clear if either of those are team records, the team’s rash of injuries is likely nature’s way of balancing out how relatively healthy the club has been over the past five years. Flames defender (and alternate captain) Mark Giordano explained how the team’s managed to keep continuity in the locker room and stay afloat in the NHL’s cutthroat Western Conference with the revolving door of bodies in and out of the line-up. Giordano credited the Flames farm system for acquiring and developing players that have been able to jump right in. One of the three newest Flame recruits is 2008 first round draft pick Greg Nemisz. A stranger to neither the Calgary locker room or many of its inhabitants, the Ontario native noted that the familiarity within the organization really helps players like himself jump up and down from the NHL and AHL. It helps that both the Flames and the Heat are in the midst of playoff races. “This time of year, both leagues are so tight and we’ve been playing in must-win games down there, too. It’s pretty similar,” said Nemisz. For the record, a breakdown of the 304-man games lost (up to the March 6 game with Montreal): David Moss (48), Brett Carson (30), Henrik Karlsson (25), Mikael Backlund (25), Anton Babchuk (24), Derek Smith (22), Mark Giordano (21), Alex Tanguay (16), Lee Stempniak (16), Matt Stajan (15), Curtis Glencross (15), Brendan Morrison (14), Blair Jones (12), Chris Butler (6), Raitis Ivanans (5), Scott Hannan (4), Blake Comeau (2), Lance Bouma (2+), Rene Bourque (1), Mike Cammalleri (1), Krys Kolanos (1). The theme of this year seems to be, “Man, that signing sure seems dumb in retrospect.” In the Flames’ current circumstances, here are three bad contracts, each bad in different ways. Stajan was signed in the aftermath of the trade that sent Dion Phaneuf to Toronto. Some thought that Darryl Sutter was scrambling to justify the trade, which brought Stajan to Calgary along with spare parts Ian White, Jamal Mayers and Niklas Hagman. To be fair, Stajan is not a bad hockey player. In fact, he’s been a very good bottom-six presence for the Flames. BUT HE’S MAKING FOUR AND A HALF MILLION DOLLARS (with a $3.5 million cap hit). For as useful as Stajan is, that’s a bit steep. Two seasons ago, the Flames were in dire need of a competent back-up goaltender. They thought they found it in Henrik Karlsson. They grabbed him at the 2010 draft for a late-round pick and, surprisingly, he turned out to be steady-if-unspectacular. He went 4-5-6 with a respectable 2.58 goals against average. So the Flames signed him to a two-year contract. But at the same time, Leland Irving was standing on his head in the American Hockey League and over the past season, he’s really out-played Karlsson. As a result, the Flames have a goaltender in Karlsson that seems to be caught in the developmental lurch – too old to really progress much further, but signed to a deal that basically blocks Irving from jumping to the NHL full-time. Karlsson can’t get enough playing time to really progress at the NHL level playing behind Kiprusoff and Irving has topped out at the AHL level. The Flames latest plan is to bring up Irving and carry three goaltenders whenever Kiprusoff needs a break, showing just how good Irving has become and how superfluous Karlsson’s presence truly is right now. A power-play specialist, Babchuk was re-signed to a two-year, $5 million contract this past summer. Why? Because Adam Pardy decided to go with Dallas’ offer (two years, $4 million) and the Flames seemed to panic. That said, the deal can somewhat be justified consider that T.J. Brodie hadn’t been amazing during the previous season and the club didn’t know how well free agent signings Derek Smith and Clay Wilson would fit into the team’s line-up. But yeah, $2.5 million per year for a guy that’s scratched almost as often as he plays is pretty bad. AHL: In a sign that the playoffs are just about to arrive, American Hockey League clubs set their “clear day” rosters – players they’re able to use during the Calder Cup playoffs. Notably absent from the Abbotsford Heat roster are T.J. Brodie and Lance Bouma (both with Calgary), Mitch Wahl (playing in the ECHL), NHL veteran Raitis Ivanans and AHL rookie James Martin. However, the Heat will be able to replace anybody on their clear day list that’s either injured or in the NHL. At time of this writing, the Heat had a 31-22-3-3 for 68 points, placing them 4th in the AHL’s Western Conference. WHL: Calgary’s 2010 first round draft pick, Sven Baertschi, is a pretty good hockey player. The Swiss forward has 94 points in 47 games and was named the WHL’s Player of the Week for the past week. What’s so special about Baertschi this week? He scored seven goals over three games. Oddly, none of them were game-winners, although Portland won two of the three games. NCAA: It was a pretty big week for Boston College. The Eagles stretched their winning streak to 11 straight games and finished off their regular season with a pair of wins over Vermont. The wins clinched the Hockey East regular season title and the first overall seed in the upcoming playoff tournament. Plus, Flames prospect Johnny Gaudreau was named the conference’s Rookie of the Month for February. Note: A previous version of this article noted that Chris Higgins was involved in the Dion Phaneuf trade. That is, in fact, wrong. It was Niklas Hagman. Apologies for the error.